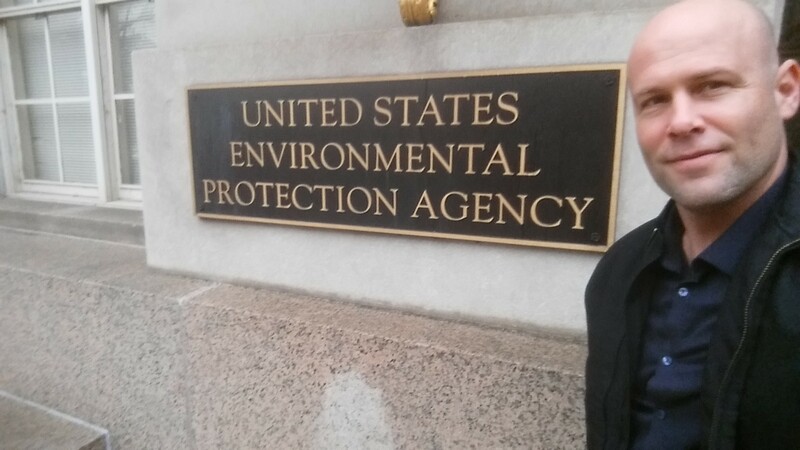 Dogwood Alliance’s Program Director, Tyson Miller, outside of the United States Environmental Protection Agency. Recently, I provided oral testimony to the EPA on behalf of the Dogwood Alliance and the forests and the communities we serve. I thanked the earnest members of the panel for their work to develop the Clean Power Plan (CPP) and expressed our strong opposition to forest-based biomass being included as suitable compliance pathway in Federal Implementation Plan for the Clean Power Plan. The Clean Power Plan has the ability to create a lasting legacy and it is evident that the ideals of the CPP are grounded in a moral obligation to citizens and future generations. However, I made sure to articulate that the inclusion of biomass takes us backwards and may actually undermine its intended purpose. Here are just a few reasons why…. Burning wood and other forms of biomass in a power plant produces about 3,000 pounds of CO2 per megawatt-hour—an emissions rate that is approximately fifty percent higher than that of a coal-fired power plant. Accordingly, biomass combustion does not reduce CO2 emissions and should not be considered part of the Best System of Emissions Reduction (BSER) envisioned in the Clean Power Plan. Diverting Important Momentum for Wind, Solar, Efficiency, etc. By enabling and promoting forest-based biomass as a compliance pathway, EPA is potentially diverting continued momentum for scientifically-grounded and non-controversial solutions such as wind, solar, energy efficiency, geothermal, tidal, etc. It is our hope that the FIP will contain the kinds of incentives and clear guidance that will spur continued technological innovations and investments in these proven and less controversial renewable energy pathways that further bring down the costs of these important technologies and support their widespread expansion. EPA only needs to look to the Southeast to see evidence for what happens when you treat bioenergy as having zero emissions. Driven by flawed renewable energy directives in the EU (with the UK being a primary driver), the volume of wood pellet exports from the US Southeast have quadrupled in the past several years. Projections of continued growth in Western Europe led by the UK are staggering and are estimated to jump from 5 million tons in 2015 to over 35 million tons in 2020. Countless investigations have directly linked wood pellet manufacturing in the Southeastern US to the accelerated logging of forests, including in sensitive ecosystems such as mature bottomland hardwood and wetland forests. Still, industry insists they use “logging residuals”, “scraps” and “waste wood”. Yet, it is estimated that 75% of the feedstock used to manufacture wood pellets in the Southeast comes from ‘roundwood’, or whole trees. These facilities simply cannot reach their desired output with residuals, byproducts, and scraps as they claim. In fact, USFS reports project not only accelerated logging across the region but also the loss of natural forests to plantations, if the biomass industry continues to expand. These trends in wood pellet manufacturing are especially troublesome given recent global maps showing that forest disturbance from logging in the Southeastern US was four times that of South American rainforest from 2000-2012. Biomass incineration creates fine particulate pollution that impacts human health. Additionally, these pellet production facilities and biomass incineration plants are often located in relative close proximity to communities. Dogwood is increasingly supporting community-led efforts to push pack proposed facilities and many residents see this as an environmental justice concern. Beyond biodiversity, standing Southern forests remove carbon from the air, provide critical flood control and protect water resources, services that are critical to both achieving carbon emission reductions necessary for avoiding the most catastrophic effects of climate change and ensuring community resiliency in the wake of a changing climate. Forests represent our best defense against climate change. Now is not the time to open the flood gates for forests to be used as fuel for electricity. Instead, we need to accelerate efforts to protect our forests and improve ecosystem health. Hopefully, the EPA will listen to the concerns of national, regional, and local organizations on this issue by not building forest-based bioenergy into the Federal Implementation Plan. Tyson has worked in the environmental and civil society sector for over 20 years and has founded/co-founded a range of initiatives including: Project for Improved Environmental Coverage, Dream of a Nation, Green Press Initiative, SEE Innovation and the Environmental Paper Network. Tyson serves as a Sr. Fellow with SEE Innovation and is on the advisory board of the Foundation for Sustainability and Innovation. When not in the office, he soaks in as much of the beauty of WNC with his family as possible. Amazing if true,,,is it? If so what percent of our southern forests are reckoned as lumber production as opposed to the pellets production…which, I agree wholeheartedly is a misbegotten idea…Even up here in the forest “preserves ” near Chicago, well intended people with degrees in env. science can’t tell a healthy forest when they see one….Theyre clearing healthy Maple, Walnut, Cherry, Basswood stands 80 years old with high quality timber to resurrect savanah…they will leave 27 Bur Oak trees on about 40 acres. The rest go as veneer logs to Asia, locally for sawlogs and firewood…the rest burnt on site….Looks downright Amazonian! Good luck fragmenting the pellet market…Im with you…Best way to help would be?? ?